The Best Activist Youtube Channels from thousands of Activist Youtube Channels in our index using search and social metrics. Subscribe to these youtubers because they are actively working to educate, inspire, and empower their audience with frequent updates and high-quality videos. About Youtuber PETA is the largest animal rights organization in the world, with more than 3 million members and supporters. Besides making videos for YouTube, we work through public education, cruelty investigations, research, animal rescue, legislation, special events, celebrity involvement, and protest campaigns. About Youtuber Amnesty International is a Nobel Peace Prize-winning grassroots activist organization with more than three million supporters, activists and volunteers who campaign for universal human rights from more than 150 countries. The organization investigates and exposes abuses, educates and mobilizes the public, and works to protect people wherever justice, freedom, truth and dignity are denied. About Youtuber I'm a vlogger, human rights activist and a survivor of the USA's their world justice system. About Youtuber Mercy For Animals is an international non-profit animal advocacy organization dedicated to preventing cruelty to farmed animals and promoting compassionate food choices and policies. About Youtuber Clarion Project is a non-profit organization providing a forum for Muslim human rights activists while challenging and exposing Islamist extremism. About Youtuber CARE actively rescue, rehabilitate, and re-home abused and neglected animals, and run a no-kill shelter, the only organization in South Korea doing so. About Youtuber My name is Tommy Robinson. I am a journalist, activist and public figure fighting for the forgotten people of the UK. About Youtuber Tim Black is a host, speaker, journalist and activist. Tim has interviewed politicians, activists, comedians and other wildly interesting public figures. About Youtuber I am a firm believer in supporting civil rights. I solemnly swear to do my part in protecting the rights of citizens and providing eduction to the misinformed via methods of judicial and constitutional activism. About Youtuber Friends of the Earth are an environmnetal charity organisation campaigning for solutions to environmental problems on both a local and international level. About Youtuber Free the People’s goal is to get ahead of politics, and engage in the cultural exchange that will set the political agenda for the next 50 years. Using cutting-edge technology and storytelling, they are building a grassroots constituency that can translate good ideas into education, conversation, and social activism. About Youtuber Green Left Weekly is not-for-profit, activist media, carrying the news, analysis & debates of environmental and social justice campaigns and movements. About Youtuber Greenpeace is an independent global campaigning organisation that acts to change attitudes and behaviours to protect and conserve the environment and promote peace. About Youtuber Welcome to #Win4News. We take to our streets, slums, wilderness reporting the local and international news. We help struggling have nots become thriving haves through human being quality talk shows and news. Our mission is to grow W4N to be world-wide and hire backpack journalist talk show hosts to report the news. We report on the stories other media either ignores or hides. About Youtuber Environmental Defence is a group of innovative and determined problem-solvers who are making a difference defending clean water, a safe climate and healthy communities.They challenge, and inspire change in government, business and people to ensure a greener, healthier and prosperous life for all. About Youtuber I'm an activist, singer, songwriter, fighter, standing up,for the right,simple as that. 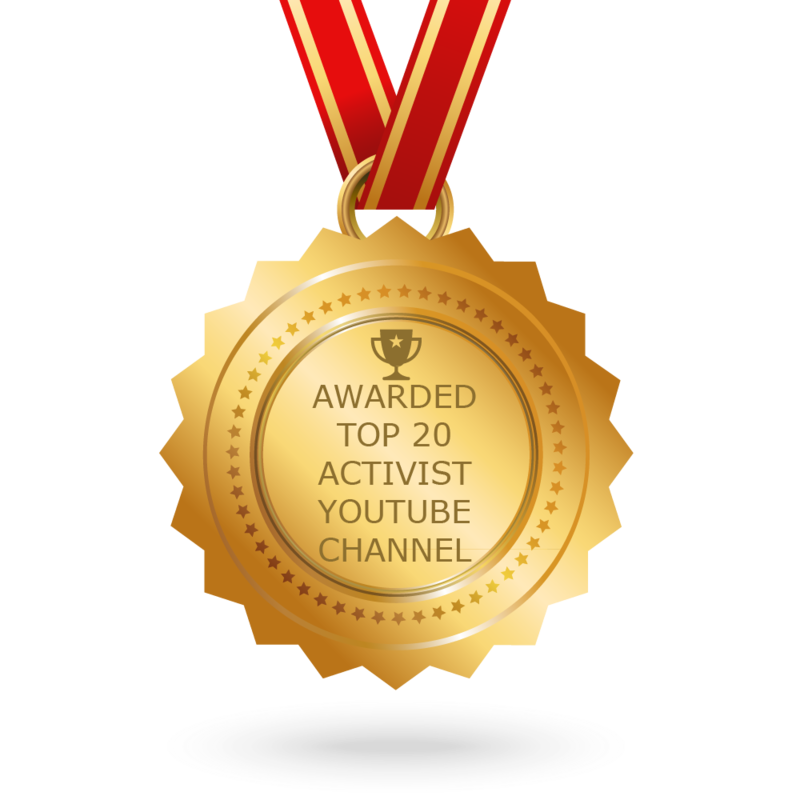 CONGRATULATIONS to every youtuber that has made this Top Activist Youtube Channels list! This is the most comprehensive list of best Activist Youtube Channels on the internet and I’m honoured to have you as part of this! I personally give you a high-five and want to thank you for your contribution to this world.